Rita Coalson is the winner of the Hospice Caregiver Award presented by Horan & McConaty. She was nominated by Rosalee Blake. 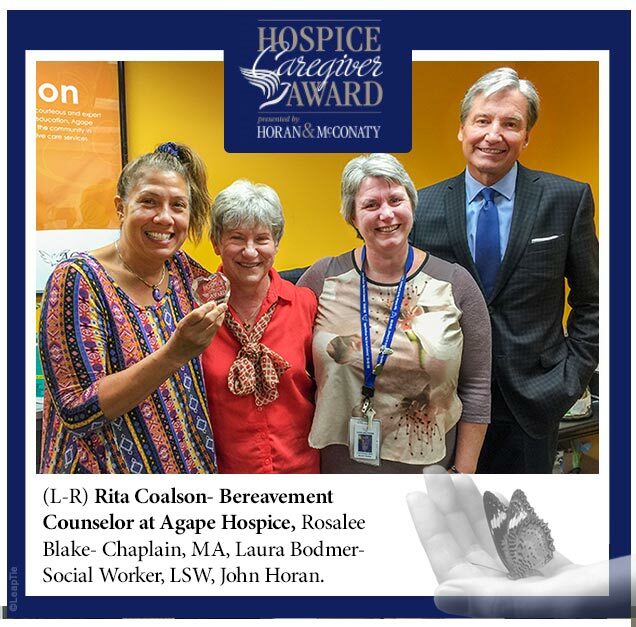 We nominate Rita Coalson for the Horan & McConaty Hospice Caregiver Award. Rita definitely fits into your recognition of “a dedicated person for her selfless devotion and generosity of heart…and a woman who excels in her profession.” She spends countless hours with her hospice patients and families, and her Agape peers. Rita’s presence, and guidance is such a gift to us all! She meets each day with smiles, warmth, laughter, and love. Rita is always willing to offer her presence and resources for those in need, no matter how busy she is. Rita has a remarkable compassion, and passion for bereavement care, whether she is working with Agape clients or team members. She is able to interact with all ages, with exemplary skills and knowledge. Rita is so fully present during our weekly North Interdisciplinary Team meetings; the team can always feel the positive energy that shines from her. She is ready to offer practical tips for self-care as we process the difficulties of hospice work. As she observes and recognizes a need for possible support, she reaches out to individuals and to the group. Rita holds space and time for her team members to process grief and loss. Rita interweaves her comments in between the team’s reflections regarding patients, families, and ourselves. It’s almost as if she is performing a dance with us all. She allows us to dive deeply into the process of grief, and to cope and manage the days when grief feels heavy. The image that comes to mind in fitting Rita is that from the Buddhist tradition of The Thousand Arms and Eyes of Compassion. This deity of Avalokiteshvara Bodhisattva hears the cries of the world and embodies the compassion of the buddhas. The thousand eyes on the palms allow the bodhisattva to see the sufferings of sentient beings, and the thousand hands allow her to reach out to help them. This beautiful and healing image of a deity fits Rita to a tea. Rita is top-notch in her profession, and we appreciate her support as we do our fieldwork, and in her bereavement care of her families! Thank you, thank you!